The semi-rimless design of Costa Bimini 120 prescription glasses combine a functionally rigid titanium frame with a professionally sound design. 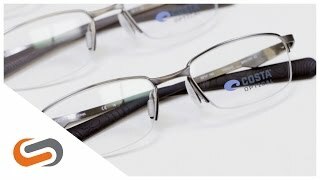 These frames from the Costa Optical line feature slightly oval shaped lenses that are integrated into a smaller frame for a classy, discreet look. Costa Bimini 120 prescription glasses deliver the comfort and durability you'd expect to have your back in all life's travels.